Explanation: Swinging around the Sun's eastern limb on Monday, a group of sunspots labeled active region AR1748 has produced the first four X-class solar flares of 2013 in less than 48 hours. 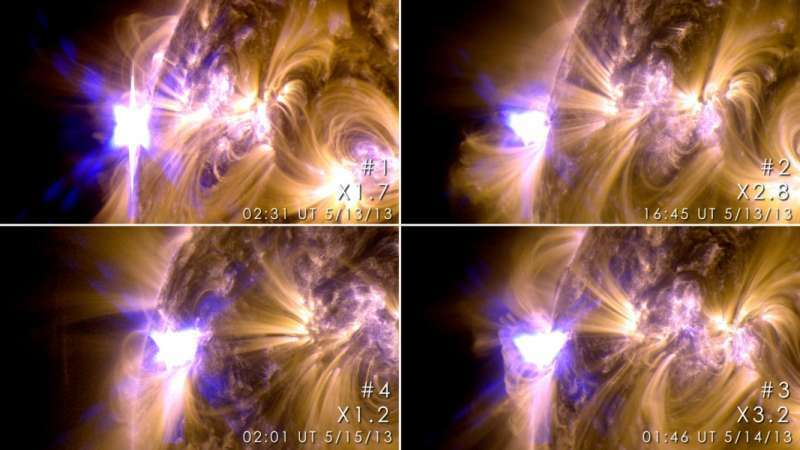 In time sequence clockwise from the top left, flashes from the four were captured in extreme ultraviolet images from the Solar Dynamics Observatory. Ranked according to their peak brightness in X-rays, X-class flares are the most powerful class and are frequently accompanied by coronal mass ejections (CMEs), massive clouds of high energy plasma launched into space. But CMEs from the first three flares were not Earth-directed, while one associated with the fourth flare may deliver a glancing blow to the Earth's magnetic field on May 18. Also causing temporary radio blackouts, AR1748 is likely not finished. Still forecast to have a significant chance of producing strong flares, the active region is rotating into more direct view across the Sun's nearside.